From left, Steve Obsitnik, Timothy Herbst, Mark Boughton and David Stemerman. New Haven — In the first debate since the Republican field of gubernatorial candidates shed a half-dozen candidates, a quartet of GOP contenders talked tough Monday night about immigrants, state spending, tolls, public-sector unions and Gov. Dannel P. Malloy — pretty much everything and everyone but each other. Danbury Mayor Mark Boughton, former First Selectman Timothy Herbst of Trumbull, tech entrepreneur Steve Obsitnik and former hedge-fund manager David Stemerman broadly sketched out their views of the challenges facing the next governor, largely sparing each other of pointed criticisms. 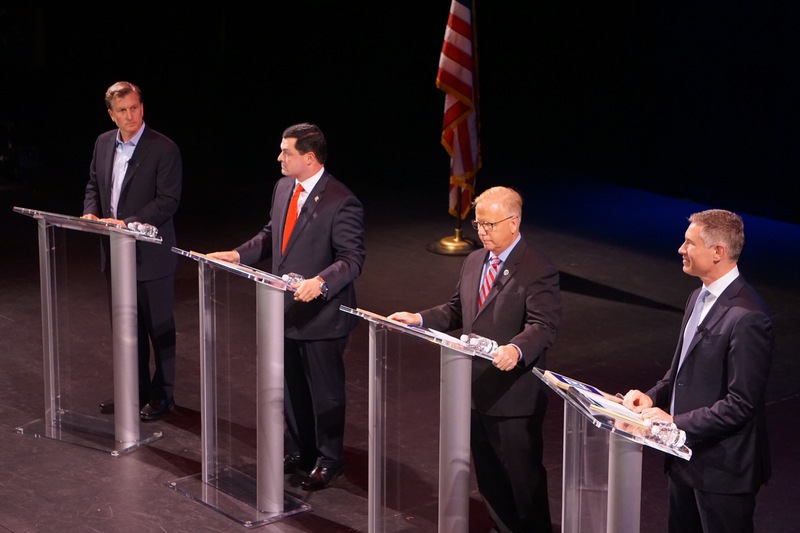 The one-hour debate before an audience of 1,100 at the Shubert Theater was sponsored by CT Realtors and televised live on WCTX, the sister station of WTNH, Channel 8. Bob Stefanowski, a political newbie whose early television advertising has given him an edge in private polling, declined to attend, as did Shelton Mayor Mark Lauretti, who was uncertain Monday if he would be able file sufficient petition signatures by the 4 p.m. Tuesday deadline to qualify for the Aug. 14 primary. It seems more likely that Republican voters this summer will have five choices on the GOP ballot: the three who qualified at the state convention last month — Boughton, Herbst and Obsitnik — and Stefanowski and Stemerman, two self-funders who bypassed the convention in favor of a petition drive. Both say they have collected sufficient signatures. Boughton, the convention-endorsed candidate and a former leader of the Connecticut Conference of Municipalities, showed no sympathy for Hartford, an easy target for Republicans seeking suburban votes. He declined an invitation to consider wealth inequality as one of the causes of fiscal stress in Hartford and cities other than Danbury, which has low unemployment. Herbst, who did not seek re-election last year as the chief executive of the Bridgeport suburb of Trumbull, similarly took a tough view of struggling cities, saying the causes of their distress was bad management, not the confluence of poverty and limited tax bases. “We have to stop rewarding bad behavior,” Herbst said. A viewer’s question about whether the candidates would welcome President Trump to campaign with them drew laughter from the audience. No one suggested that Trump, who easily won the GOP presidential primary here and then decisively lost in November to Hillary Clinton, keep his distance from Connecticut. But he quickly pivoted away from Trump, saying the president didn’t cause Connecticut’s problems, nor would he solve them. The candidates all pledged to varying degrees to help the Trump administration enforce immigration laws. Herbst issued a warning to the mayors of Hartford, New Haven and Bridgeport. All four indicated a willingness, or even an eagerness, to try to attack Connecticut’s unfunded pension liability by changing benefits dictated by a collective bargaining agreement that runs until 2027. Exactly how they would do that was left unclear. “We can’t reform this. We have to restructure it,” Stemerman said. Herbst said he would not accept a pension, nor would his top appointees. Obsitnik said he would declare a state of fiscal emergency to attack the unfunded liability, which is routinely rated as either the worst or among the worst in the U.S. The Malloy administration has negotiated a more modest and sustainable system of retiree benefits for new employees, but the Republicans said the state must be more aggressive. The candidates share one thing in common with Malloy: Like the Democrat, who is not seeking re-election, they see the state’s aging transportation infrastructure and its depleted special transportation fund as major challenges. All promise better transportation, though none committed to new revenue. Ned Lamont, the presumptive Democratic nominee, is open to electronic tolling as a source of transportation revenue, but the Republicans said the state needs to be more efficient in transportation spending, not impose tolls on motorists. Too much transportation money has been deferred for other uses, they said. Stemerman said after the debate that the candidates did not offer sharp distinctions. “The challenge with a format like this is even though we’re now down to four candidates there is only so much time — with a one minute response, it’s going to be hard for anybody to distinguish themselves,” he said.